Ryan Gosling as Sgt. Jerry Wooters in Gangster Squad (2013). Continuing BAMF Style’s recent string of neo-noir period film posts following a swaggering L.A. detective decked out in period attire, I decided to take another look at the recent movie Gangster Squad. Described (by me) as L.A. Confidential for the video game crowd, Gangster Squad is loosely based on the true story of LAPD detectives John O’Mara and Jerry Wooters’ team that took a head-on approach to breaking Mickey Cohen’s rackets in the ’40s and ’50s. Although stylish, well-casted, and full of thrilling action pieces, Gangster Squad received some criticism for its lack of character development and condensing the multi-decade efforts of these detectives into just a few months in late 1949. Facts were played with, narrative structure was ignored in favor of on-screen action, but the end result is still an entertaining, glossy look at the gangster-era L.A. we want to remember. Plus, I’ll never complain when a movie contains plenty of sharp vintage suits, alluring dames with dangling cigarettes, and nonstop Thompsons blasting away at each other. Ryan Gosling plays Jerry Wooters, one of the real-life detectives assigned to the “Gangster Squad”. He is established early on as a Jack Vincennes-type, cynical about his police work, shifting his focus to getting laid and getting paid by any means necessary. This scene, set at Slapsy Maxie’s, establishes both of those end goals in the forms of Grace Faraday (Emma Stone) and Jack Whalen (Sullivan Stapleton), two of Cohen’s associates. Whalen was indeed a career criminal who worked as a mob contract killer and had actually served in the U.S. Army Air Force during WWII, but Grace was developed to give the film its needed femme fatale and give Gosling someone to hop into bed with. Mary Zophres has a fine reputation as a master of period costuming, accurately updating classic looks to convey both character-specific traits and modern appeal. With a resume that includes O Brother Where Art Thou?, Catch Me If You Can, No Country for Old Men, and True Grit, Zophres has transcended genres and eras to prove that she can nicely outfit a rough Westerner or a sleek ’60s con man with equal aplomb. Her inspiration for Jerry Wooters came from “classic but stylish” leading men of the era like Clark Gable and Errol Flynn, as she explained to Entertainment Weekly. Wooters is easily the most fashionable of the main cast, fitting for his personality. Josh Brolin and his character John O’Mara evidently both approach clothing with the same utilitarian view and just wear what’s needed for the job. The others are equally well-outfitted from Robert Patrick’s old-fashioned lawman wearing a throwback duster to the heavily made-up Sean Penn taking Mickey Cohen’s fashion obsession to a new level of vanity. At one point early on, Ryan wears a three-piece double breasted. I was obsessed with that. At that point he has one foot inwith the gangsters and one foot as a cop. He is the only one of the Gangster Squad who wears double-breasted – but by the end, he’s wearing a three-piece single breasted suit. For Ryan’s sport coat, there was a couple of rolls of fabric we found in a store in LA called International Silk & Woolens. There were a couple of rolls of an old wool that was from the fifties, and we had enough for me to make six sports coats for Ryan. Wooters doesn’t have much hatred for gangsters early in the film as he enjoys a steak and a Scotch with Jack Whalen. Wooters’ suit exemplifies the roomy, post-war fit that became fashionable as men broke away from the restricted (and restrictive) styles offered during the war; servicemen naturally had to sport their itchy uniforms everywhere while men at home were reduced to wearing old suits or the scanty, tight-fitting suits produced during the war’s fabric rationing. After the war and the rationing, men embraced long and loose jackets, vests, and pleated trousers. Hats grew larger while loud shirts, ties, and display handkerchiefs shouted out that the war was over and hedonistic comfort was in. With casual attire also growing in popularity, men put much attention into the way they would dress up. Wooters’ suit jacket shows off the strapping profile that a man would desire with strong, padded shoulders with roped sleeveheads – emphasized by long peak lapels – a suppressed waist, and a long flared skirt for an athletic “hourglass” effect. I won’t blame you for paying more attention to Emma Stone than the fit of Gosling’s suit. It took me some time before I even realized he was in this photo. I also happen to think the shorter suit that is happening in men’s fashion right now is fine for the likes of Ryan Gosling but it’s not necessarily a look for the older gentleman. Maybe this movie will help make a little longer jacket come back – it’s a very flattering look. Wooters’ brown pinstripe suit jacket has a low 6×2-buttoning double-breasted stance to accommodate both the length of the jacket and Gosling’s long torso on his 6′ frame. The three dark brown buttons on each cuff match those on the front. The jacket also has a welted breast pocket, straight flapped hip pockets, and a ventless back. Wooters oozes confidence as he mixes casually with gangsters and shoeshine boys alike. Do you ever wonder why you leave the bar alone? Wooters doesn’t leave alone, and he’s sporting a boutonnière in his lapel. Make the connection. Little of the rest of the suit is featured in this scene under the large jacket, but we get a few looks at the single-breasted matching vest with its five widely-spaced buttons with the lowest button correctly left open over the notched bottom. Appropriately for the luxurious-fitting suits of the era, we see little of the shirt and tie underneath; thus, a fashion plate like Wooters works to ensure that his shirt and tie get noticed despite the suit’s best efforts. Both the suit and tie were made for the film by Anto. Wooters’ shirt also has a fashionably long point collar and rounded button cuffs. Wooters’ rayon tie is surprisingly understated with a few sporadic white and blue floral spots on a russet brown ground. It’s good to know that Ryan Gosling appreciates fine style as much as his character does. Despite the hubbub surrounding them, this is the only glimpse the scene gives us of Wooters’ vintage spectator shoes. Wooters’ wide-brimmed fedora is another example of a true vintage product that made its way into production. The hat is brown felt with a thin, matching grosgrain ribbon and a pinched crown. It is unlined with the manufacturer’s silver logo printed on the underside of the crown. We made a lot of hats for everybody – it’s important to find the right one for each actor. Fit is so important. For Josh’s hat, he has a bigger head so we tried fifty hats on him. To tell you the truth, in the end we took the crown from one hat and the brim from another and had Optimo make his hats in the perfect medium brown. Whereas Ryan wore all original hats – we only made duplicates because he needed some doubles. Then we made Sean Penn’s at Optimo also, on a pattern of hat made in the Twenties. 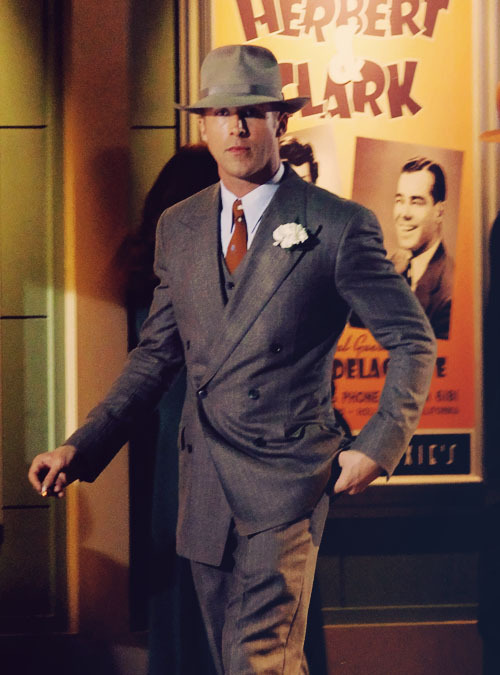 Gosling struts around the set in his vintage fedora, which ironically gets its most screen time when he takes it off. As one might expect from a flashy celebrity cop who takes pride in his appearance, Wooters accessorizes on each hand. He wears a gold ring with a large dark brown stone on his right pinky, and a stainless dress watch with a yellow rectangular dial is fastened to his left wrist on a brown leather strap. Wooters subtly shows off his accessories. Two things. Firstly, that tailoring is hugely important. If your waist is a little big, fix it. If your shoulders are drooping down, it can be fixed with an easy alteration. The second and the biggest thing is when wear a suit, don’t be afraid to dress up. I think it’s become cool to dress down, but there’s nothing more handsome than a man in a suit. This is coming from a Hollywood costume designer, fellas. Suit up. Wooters’ nightclub suit is a great example of updating classic fashion to appeal to modern men without sacrificing accuracy. Comfort and class – with hints of indulgence – defined men’s post-war style, and this is a good illustration of getting that combination right. For his night out on the town, Wooters wears a large white carnation on his left lapel. Grace: What’s your racket, handsome? Jerry: I’m a bible salesman. Grace: Want to take me away from all this and make an honest woman out of me? Jerry: No ma’am, I was just hoping to take you to bed. Thanks for this post and I hope you do some more from this film. The movie was trashed by the critics and ignored by the public……but I liked it. Everything about the movie worked. The costuming, action, and especially Sean Penn’s hammy acting made Gangster Squad a very entertaining film. 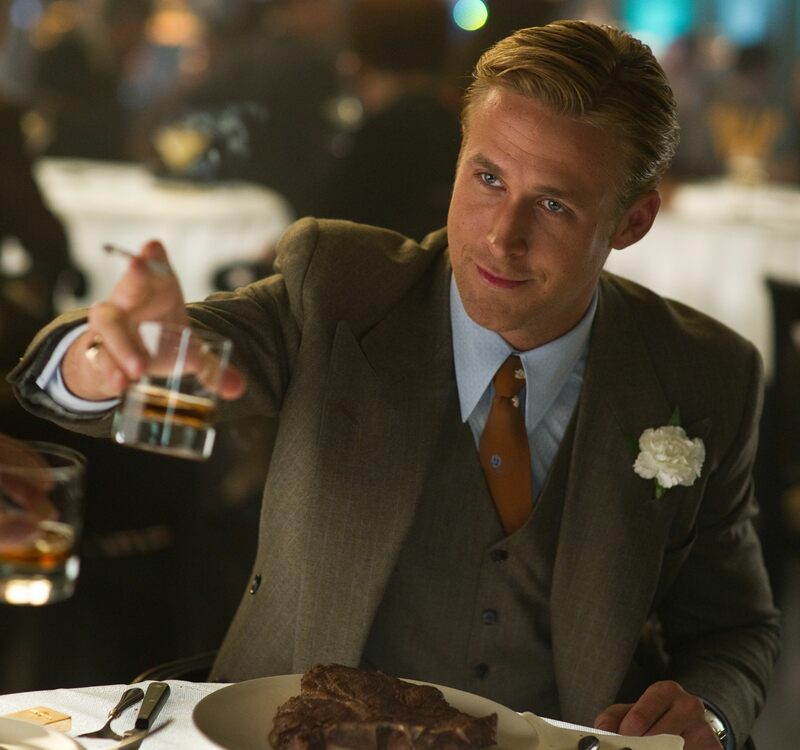 Gangster Squad and Mad Men revived my interest in wrist watches in the 38mm-40mm range….any help identifying the one Gosling’s character wears…..Teeritz?? Thanks, Craig! I have a couple more planned, especially given the wealth of information that Zophres and the cast members shared in interviews about the film’s style. It was a great theater experience to see well-dressed guys blazing away with Thompsons on-screen, and I was glad to see Gosling carrying my personal favorite old time carry weapon, the Colt 1903. I need to develop some sort of Teeritz siren akin to the bat signal so he can see when a page is in need of watch guidance. That guy knows his stuff!! I had to check the IMFDB.org posting for this film to see what Gosling carried…..I knew you would greatly approve. There is a great selection of firearms used in this film, from the BAR’s to the grease guns; the armorers used by the producers really chose some interesting pieces. Gentlemen, you are too kind. Whatever knowledge I have doesn’t extend back earlier than around 1950. A lot of ’30s and ’40s wristwatches were rectangular, made by brands such as Hamilton, Elgin, Longines, for example, and they could tend to look very similar to each other to my untrained eye. I don’t tend to look at watches from those eras because A) they’re a little small for my tastes, and B) their timekeeping can be a little lax. Although, a decent watchmaker can usually do something about that. Oh, I meant to add, “Gangster Squad” was a better film than I remembered. It was on TV here about a month ago and I remember thinking how good looking this film was. Cinematography was pin-sharp, as were the suits. May have to nab it on DVD or BluRay at some point.